What a difference 20 million miles makes! Images of Pluto from NASA's New Horizons spacecraft are growing in scale as the spacecraft approaches its mysterious target. The new images, taken May 8-12 using a powerful telescopic camera and downlinked last week, reveal more detail about Pluto's complex and high-contrast surface. 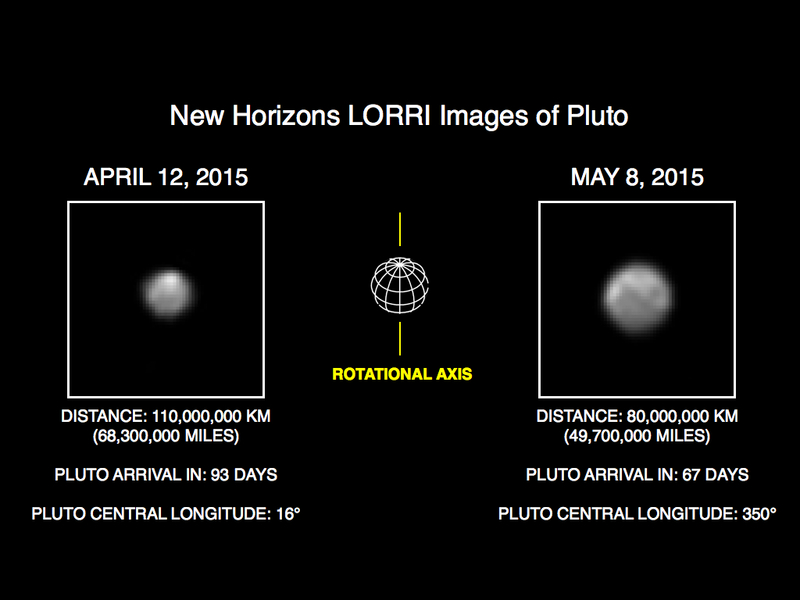 These images show Pluto in the latest series of New Horizons Long Range Reconnaissance Imager (LORRI) photos, taken May 8-12, 2015, compared to LORRI images taken one month earlier. In the month between these image sets, New Horizons' distance to Pluto decreased from 68 million miles (110 million kilometers) to 47 million miles (75 million kilometers), as the spacecraft speeds toward a close encounter with the Pluto system in mid-July. The April images are shown on the left, with the May images on the right. All have been rotated to align Pluto's rotational axis with the vertical direction (up-down), as depicted schematically in the center panel. Between April and May, Pluto appears to get larger as the spacecraft gets closer, with Pluto's apparent size increasing by approximately 50 percent. Pluto rotates around its axis every 6.4 Earth days, and these images show the variations in Pluto's surface features during its rotation. "These new images show us that Pluto's differing faces are each distinct; likely hinting at what may be very complex surface geology or variations in surface composition from place to place," said New Horizons Principal Investigator Alan Stern, of the Southwest Research Institute in Boulder, Colorado. "These images also continue to support the hypothesis that Pluto has a polar cap whose extent varies with longitude; we'll be able to make a definitive determination of the polar bright region's iciness when we get compositional spectroscopy of that region in July." "By late June the image resolution will be four times better than the images made May 8-12, and by the time of closest approach, we expect to obtain images with more than 5,000 times the current resolution," said Hal Weaver, the mission's project scientist at the Johns Hopkins University Applied Physics Laboratory (APL) in Laurel, Maryland. APL designed, built, and operates the New Horizons spacecraft, and manages the mission for NASA's Science Mission Directorate. SwRI leads the science team, payload operations and encounter science planning. New Horizons is part of the New Frontiers Program managed by NASA's Marshall Space Flight Center in Huntsville, Alabama.